Bill Domhoff's classic book, Who Rules America?, was first published in 1967. Now in its 7th edition, it has never been out of print. 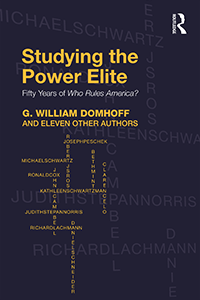 To celebrate WRA's 50th anniversary, Routledge has released a new book entitled Studying the Power Elite: Fifty Years of Who Rules America?, featuring essays from Bill and 11 other contemporary sociologists and political scientists. This book critiques and extends the analysis of power in the classic, Who Rules America?, on the 50th anniversary of its original publication in 1967 — and through its subsequent editions. The chapters, written especially for this book by twelve sociologists and political scientists, provide fresh insights and new findings on many contemporary topics, among them the concerted attempt to privatize public schools; foreign policy and the growing role of the military-industrial component of the power elite; the successes and failures of union challenges to the power elite; the ongoing and increasingly global battles of a major sector of agribusiness; and the surprising details of how those who hold to the egalitarian values of social democracy were able to tip the scales in a bitter conflict within the power elite itself on a crucial banking reform in the aftermath of the Great Recession. These social scientists thereby point the way forward in the study of power, not just in the United States, but globally. A brief introductory chapter situates Who Rules America? within the context of the most visible theories of power over the past fifty years — pluralism, Marxism, Millsian elite theory, and historical institutionalism. Then, a chapter by G. William Domhoff, the author of Who Rules America?, takes us behind the scenes on how the original version was researched and written, tracing the evolution of the book in terms of new concepts and research discoveries by Domhoff himself, as well as many other power structure researchers, through the 2014 seventh edition. Readers will find differences of opinion and analysis from chapter to chapter. The authors were encouraged to express their views independently and frankly. They do so in an admirable and useful fashion that will stimulate everyone’s thinking on these difficult and complex issues, setting the agenda for future studies of power. John L. Campbell Institutions, Policy-Planning Networks, and Who Rules America?